I now turn to the most prominent features in the Inner Arbor plan, starting with the Caterpillar. For context and more information see other posts in this series (part 1, part 2, part 3, part 4). For a good summary of the proposed features see Andrew Metcalf’s story “Breaking Down the Plan to Develop Symphony Woods” at the Columbia Patch. For more on the vision behind the Inner Arbor plan and some inspirations for its features, see the Columbia Association’s original presentation on the Inner Arbor plan. My focus continues to be on the following questions for each feature: Does it work? Is it beautiful? Will it last? What’s the cost? The Caterpillar in Symphony Woods / Merriweather Park in the Inner Arbor plan. (Click for a higher-resolution version.) Image © 2013 Inner Arbor Trust; used with permission. The Caterpillar is designed to serve multiple functions (almost too many, as I’ll discuss below). However its primary purpose is very simple: to provide an attractive visual and physical barrier between Symphony Woods and Merriweather Post Pavilion. The feature itself is 12 feet high, high enough to (hopefully) discourage rowdy visitors from climbing over it, but low enough to remain roughly human-scaled; see the graphic above for a sense of how it would appear in relation to people.2 Gateways at either end (where the Caterpillar structure arches over the paths) are designed to funnel pedestrian traffic between Symphony Woods and the pavilion. Note that the Caterpillar would not entirely substitute for a fence. For one thing, it does not cover the entire property line between Symphony Woods and Merriweather Post Pavilion; at its eastern end it actually turns away from the property line and heads northeast. For another, it is located some distance north of the property line, and thus divides a significant part of Symphony Woods closest to Merriweather from the area further north. 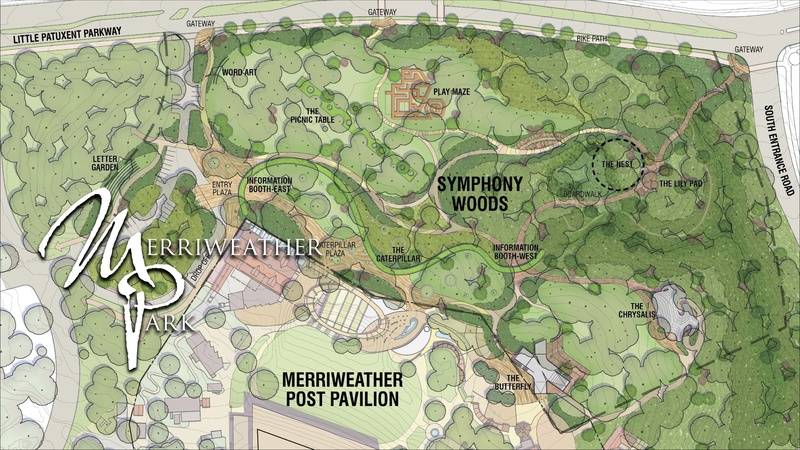 This arrangement appears to be due to the design team’s desire to integrate the Symphony Woods property with the existing Merriweather property: The area just south of the Caterpillar is intended as a transition zone containing both features in Symphony Woods (the Caterpillar Plaza) and features in Merriweather proper (including a proposed oval-shaped feature that I believe is intended to be a fountain). 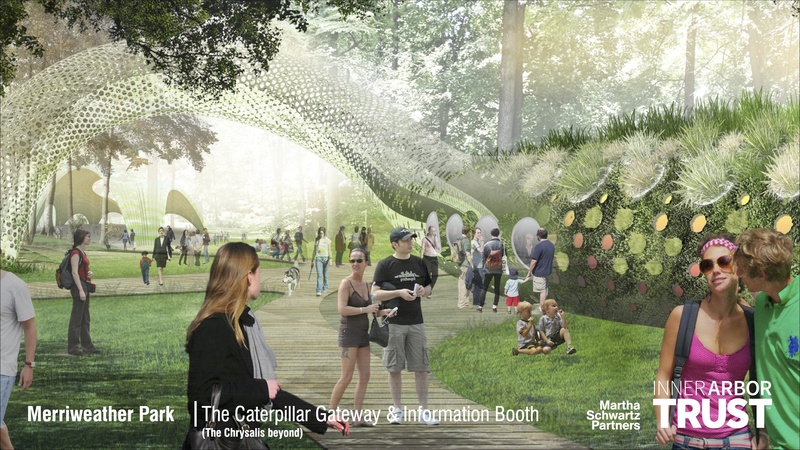 Caterpillar Gateway and Information Booth-East, with the Chrysalis visible in the distance. (Click for a higher-resolution version.) Image © 2013 Inner Arbor Trust; used with permission. In addition to acting as an attractive visual and physical barrier, the Caterpillar also helps with the prosaic problem of providing utilities for events such as Wine in the Woods. The structure is hollow, and thus could contain electrical lines, water lines, computer network cables, and anything else needed to support events in Symphony Woods. Some of the space immediately north and south of the Caterpillar could be used for event tents and other temporary structures, the fronts of which would face the paths and the backs of which would be next to any power or other utility outlets embedded in the Caterpillar. The Caterpillar could also support wireless access points to provide WiFi signals to a good portion of Symphony Woods and to the transition area between the woods and Merriweather Post Pavilion. 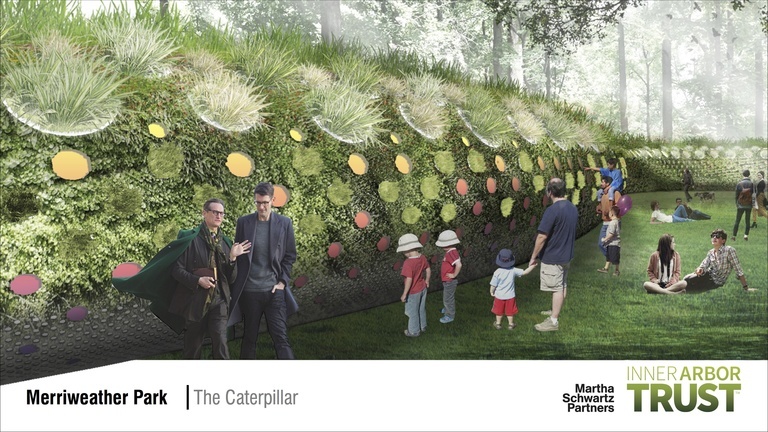 The Caterpillar could also support a number of other uses: At either end it could contain information booths for visitors to the park or the pavilion. Since the structure supports potted plants as the main visual element it could be used as a sort of community garden to raise flowers or herbs, and since it’s intended to be lighted from within it could be used for visual art of various sorts. In the pre-submission meeting Martha Schwartz mentioned other uses as well, including having “portals” through which people could view artworks or educational displays, supporting “audioscapes” either natural (e.g., activated by the wind) or artificial (using speakers), or having the structure interact with visitors via smartphone or tablet apps. A concern I have with these ancillary uses (which I tried but perhaps failed to clearly express in a question I asked at the meeting) is that having the Caterpillar simultaneously support too many functions could cause visitors to be confused as to what the Caterpillar is supposed to be for and how they should interact with it. (It’s a similar problem to that seen in many interactive art installations.) Perhaps one way to mitigate this concern would be to treat the Caterpillar as a platform capable of supporting multiple activities, but to limit the activities at any one time to a reasonable number. For example, different seasons could call forth different uses of the Caterpillar, or one end of the Caterpillar could support one activity while another activity would be supported at the other end or in the middle section. The Caterpillar is intended to be attractive, with its plants and interior lighting. Could it be beautiful as well? Quite possibly, if good taste is exercised in the selection of plants and the arrangement of the lighting. However it could also end up looking tired and bedraggled if it were not well-maintained. The Caterpillar is essentially a lighted garden arranged as a narrow strip and wrapped around a metal tube; it would require at least as much maintenance as any other garden, and likely more due to the difficulty of getting to the top part of the structure. Watering and spraying the plants, rain and snow, and the occasional insults from ill-behaved visitors would also take their toll on the structure and any activities intended to be supported by it. To re-use the analogy I used above, anyone who’s visited interactive art installations (and I’ve been to more than my share) is familiar with installations where half the features are completely inoperative and the other half are misbehaving in some way. Whatever the initial cost of the Caterpillar might be, it’s likely to be outweighed by the long-term operational expenses of keeping up its appearance and making sure that all its functions are working properly. In the next post I’ll continue with the life cycle of metamorphosis and look at perhaps the showiest feature of the Inner Arbor plan, the Chrysalis. Note that in the master plan graphic the information booth on the west end of the Caterpillar is mislabeled “Information Booth-East”, and the booth on the east end is mislabeled “Information Booth-West”. The two gentleman in the front left of the picture always crack me up. It’s clearly a warm spring or summer day and everyone else is dressed accordingly, but the two men in question persist in wearing dark clothing, jackets, and even a scarf (!) and cape (!!). The mystery is solved if we realize that they are intended to represent architects and designers, and are wearing the uniform of their profession.